Theresa Anthony, senior director for Expo and Management for the National Confectioners Association, distributes candy packets to commuters at the Captiol South Metro Station with recently-published candy industry job statistics printed on them. SHFWire photo by Rebecca Anzel. WASHINGTON – The U.S. candy industry has a problem. The sugar it needs to produce sweet treats is protected by the government through tariffs and trade restrictions, which drive up the price, industry officials say. This has forced some companies to move production to places where sugar is cheaper, including Mexico or Brazil. Atkinson Candy Co. is one of those companies. Founded in 1932 in Lufkin, Texas, the family-owned maker of Chick-O-Stick, Coconut Long Boys and other brands moved its production of Mint Twists to Guatemala in 2010. Candy company executives from across the United States are on Capitol Hill this week to discuss industry concerns with their representatives in Congress as part of an annual Washington forum hosted by the National Confectioners Association. 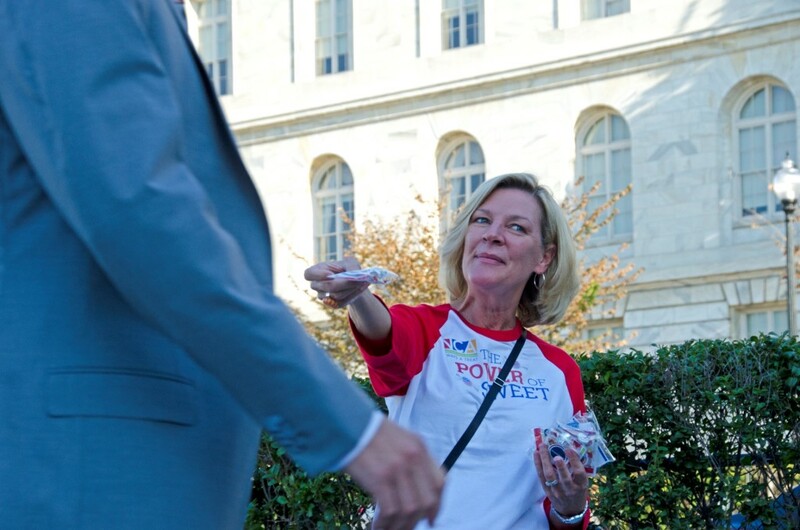 NCA had staffers distributing candy to commuters at the Capitol South Metro station Thursday morning and later hosted a press conference at the Newseum to announce the results of a report it commissioned about the candy industry’s impact on the economy. Called “The Power of Sweet,” the report found that for every confectionery job created, an additional seven jobs are supported in related industries, collectively employing 465,000 people. Sen. Kelly Ayotte, R-N.H., promised at the press conference that she would continue working to eliminate the “wasteful spending … of sugar subsidies.” Swiss chocolate maker Lindt & Sprüngli has its American plant in New Hampshire. House Minority Whip Steny Hoyer, D-Md., said “there is no excuse” for Congress not reauthorizing the Export-Import Bank in July. The bank assists private companies to make international sales. He urged the candy industry officials to speak to their representatives in Congress about the subject. The American government employs trade restrictions and tariffs to guarantee domestic sugar growers a price of 33.13 cents per pound of sugar, according to the Department of Agriculture. This practice is included in the farm bill, a piece of legislation President Obama likened to a Swiss Army knife because of its many other components. Many candy makers blame these policies for their need to outsource and have been working for years to get Congress to repeal them. American Sugar Alliance spokesman Phillip Hayes said he agrees the sugar industry does not need the current policy of tariffs and trade restrictions, but only if sugar competed on a global free market. Other governments, including those in Brazil, India and Thailand, heavily subsidize their sugar industries, making the price of their exports much lower than those from the U.S. If the protections were removed before a free market was established, Florida State University economics professor Randall Holcombe said, a lot of sugar producers would go out of business. The price of sugar is about the same as it has been for the last 30 years, according to the American Sugar Alliance, so the candy industry is actually not spending as much as it thinks it is when taking inflation into account. And Hayes said the data released at press conference Thursday reflects how well the candy industry is operating with the current policies in place. Many candy makers, though, said the industry could maintain more American jobs if the sugar protection policies were not in place.